My Grandfather Clock has Stopped, Can I Fix It? Everything was fine until we moved the grandfather clock, Now my Clock has Stopped. While Grandfather clocks are misunderstood to be very fragile and delicate. Grandfather Clocks are actually very durable. When the grandfather clock is not working after a move, there are a few problems to look for that can be easily fixed. 1) Examine the dial on the grandfather clock and check to make sure the hands are not touching or hanging on any parts of the dial or second hand. 2) Check the leveling of the grandfather clock. There are 4 adjustable levelers on the bottom corner of most grandfather clocks. 3) Start the pendulum swinging with a mild push of the hand and make sure your pendulum is swinging freely and not touching the chime rods or weights. 4) Listen to the ticking of the grandfather clock to make sure you are hearing a very even “tick-tock”. Even space between the tick and the tock. If not, the clock is out of beat and needs to be corrected. If your clock is a chain driven grandfather clock, the chains should be in the order as in the image. If you listen to the clock just after you give the pendulum a push and notice that the clock is not tick tocking evenly, this means the clock is out of beat. The clock must have an even tick – tock – tick – tock. If it is uneven, like tick/ tock — tick /tock — tick /tock … Read how to set your grandfather clock in beat to correct this. This is very common after a grandfather clock has been moved from one location to another. If one of the above four steps do not seem to be the problem, It would be best to call in a pro. You may find a list of clock technicians at here. If you are looking for new grandfather clocks, please click here. 30 responses on My Grandfather Clock has Stopped, Can I Fix It? The grandfather clock weight chains should be in the order as seen in the image above. I looked over all the information on here and am still having no luck in getting my clock working again after a move. I’m thinking there is a deeper problem. There is no tick-tock at all when the pendulum is swinging. Opening up the side and observing the gears, they are also not moving with the pendulum. The gear attached to the pendulum just rocks in place not moving the gear below it. Any thoughts? Hi my clock starts ticking for a few minutes then stops after following your steps the only thing I notice is that the pendulum does start to twist round slightly when swinging which may be a problem I not sure if there is something missing as it doesn’t seem supported very well. If your pendulum is swinging in an elliptical pattern, this can cause the clock to stop. Check your leveling first and if the leveling is good, it is probably a distorted suspension spring. It would need to be replaced. They are available at merritts.com. This illistration was a great help to me. I purchased a herschede grandfather clock and the pendulum and extension was supplied but this illustration helped me to connect it all up correctly!! The chime selection lever is too loose, and it does’t hold any more. It was fine all these years.The model #610-671. Often times when the silencing option is enabled, the middle weight drops more quickly. It would seem that something has gone awry with this setting and I would recommend contacting a professional to take a further look. If you clock is level and you are only hearing the tick on one side, setting the beat in the instructions about may solve your problem. You should start by moving the pendulum hanger in the direction where it should have ticked until you fell some resistance and then just a bit further in the direction…then try again. Sometimes it may take several times to get it right. Two black wires like hanger thickness equidistant in length sticking out behind the pendulum. I hear one it might be clicking on one on the right. Our level showed level both front and side measures. It chimes at the qtr hour and ran about a minute or two and slowed and quit. We moved it here from the warehouse where it was running for two weeks. It chimed on the qtr when we first put it in our home yesterday, and ran a couple min. Tonight 24 hrs or more, it does the same thing. It may be that your pendulum is hitting one of your chime rods on the right and stopping the pendulum. 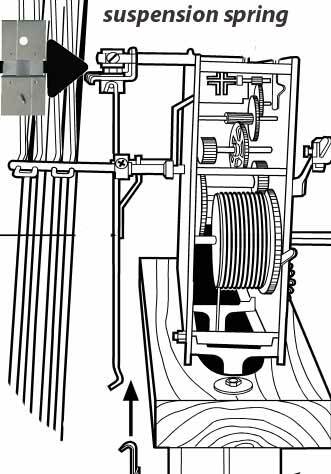 Look inside and see if the pendulum of your grandfather clock is moving without obstruction or possibly touching one of the chime rods. If it is, you might want to slightly increase the height of the back levelers and see if it will clear it. If it still touches the chime rod, the rod will be to be bent back to the pendulum may swing freely on your clock. Be careful not to break the chime rod. Hold the rod and slightly move it back and forth away from the pendulum area. The rods themselves do not bend as they are very brittle. They can snap off at the top if you are not careful. I make the mistake of hold the weight up while winding the clock and now the is no tic-toc as the pendulum moves. Hi Reggie..What has happened is your cable for the middle weight for your key wind grandfather clock is probably crossed. A crossed cable is where the cable is overlapping inside the cable drum and stopping the clock. You may get the clock to unwind by taking the pendulum off and letting it tick fast till the weight gets to the bottom. You might have to add about two finger pressure on the top of the middle weight to keep it going during this time. This usually takes a few hours for it to wind down. If it winds down all the way, you should be able to wind it up normally and place the pendulum back on and it may be fine. It not, you will need a technician to manually release to weight from inside. The pendulum swings between the chime rods and the weights. My guess is the grandfather clock is not level in its new home. The levelers on the bottom back need to extend to slightly raise the back so the pendulum will not touch the chime rods. Just bought a reproduction wind up grandfather clock. It was fully wound when bought .got it all leveled out .but pendulum swings for 5 to 20 minutes and stops. Take pendulum off and clock tick-tocks. If the clock is running without the pendulum attached, it sounds like the pendulum is touching either the chime rods behind the pendulum or the weights in front of the pendulum. This might be caused by the front to back leveling of the grandfather clock. If the back is too high, the pendulum will drag on the weights and stop the clock. If the front is too high, it will drag on the chime rods. Also, check for an even tick tock with the pendulum attached. I bet it is dragging on the weights or chime rods. Pleas help; Any advice you can offer would be welcome. Hi..this is really hard to determine without being in front of the grandfather clock. You were doing the right things to bring the weights down. My guess is that the clock is out of beat. If the clock is getting power from the weight, the hanger should move back and forth quickly. Try setting the beat with the pendulum off. Hello Sandy…Something had to have physically caused the pendulum to change position. You can easily hold an upper section of the pendulum and with your other hand hold the pendulum “bob” (the round part) and it will easily twist back to the position where it should be. You want the pendulum bob to be about the same distance from each side to the back of the clock. Make sure the pendulum is not touching the weights or the chime rods. It is best to use two paper towels or gloves as not to handle the pendulum with your bare hands. This should work easily for you. hi My clock will stop while I am away for two weeks (no one to look after it). Is it best to let the weight get to the bottom after its 8 day cycle, or am I best to stop the clock with the weights at the top and restart on my return. Obviously trying to avoid any damage to the mechanism. The best practice when you find you are going to be away from the clock and not able to wind it is to stop the pendulum the morning when you leave. For example, stop the pendulum before you leave that given day say at 7:00 AM. The next morning after you return, simply start the pendulum at the same time as when you stopped it. 7:00 AM in this example. This way you will not have to reset the time and the clock will run as if you never left. If your clock does have a moon dial, you might want to advance the moondial the number of days you were gone if you wish to keep the lunar phase display accurate. This is a quick way to fix that incorrect hour count on your mechanical grandfather clock chimes the wrong hour. For example, let’s say it is really 2:00 and your clock chimes 5 times to count the hour. Your grandfather clock dial says it is one time but the grandfather clock chimes another hour? There is a simple fix for this issue if your grandfather clock is striking the wrong hour. 1) When your grandfather clock strikes the next hour, count the number of strikes. 2) Move only the shorter hour hand to the number on the dial that you just counted when the clock chimed. The clock chime is now in sync with the hour count…but the time on the dial is now wrong. 3) Set the time on the grandfather clock using the minute hand to the correct time where you are located. Now your clock is chiming properly indicating the correct hour. If my clock stops working well could it be dust? If so can I clean it? I don’t want it moved. Pulled pendulum chain weight too high and seems to be in a bind ?? Pendulum has stopped …… how can I release or get the chain/weight down to fix this issue. You can try taking off the pendulum from the grandfather clock and gently moving the pendulum hanger where you removed the pendulum back and forth just enough to hear a tick at each side. If you do this a for a few minutes, the weigh may lower enough to run on its own. I got my pendulum swinging in sync after a half hour of fiddling with it. So far so good, thanks for the great advice. Saved me $150.00 that my clock guy charges to come out here in the country. I am glad this worked for you and saved you some money.